RadMediaPlayer is a new addition to the Telerik's control kit for ASP.NET AJAX. And as a part of the UI bundle, it possesses the main feature of every rad control - provides the developer a useful and convenient tool designed for achieving fascinating results in a sharp time frame. 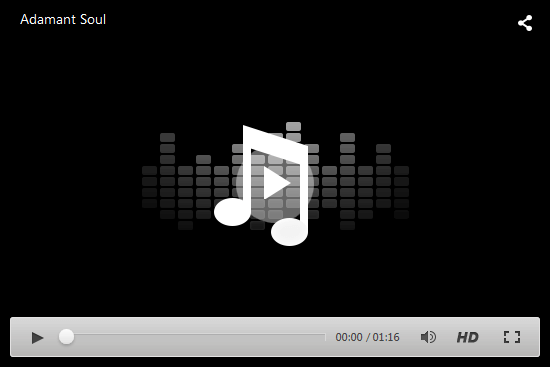 RadMediaPlayer can be used for presenting video and audio files from static sources or streaming online YouTube clips to enrich your web site with dynamic content in a user-friendly interface. Configuring RadMediaPlayer is a quite straightforward and not time-consuming task once we know the proper steps to follow. The player uses the video and audio functionality provided by the browsers in accordance with the HTML5 standard, which means that the same format type requirements apply. 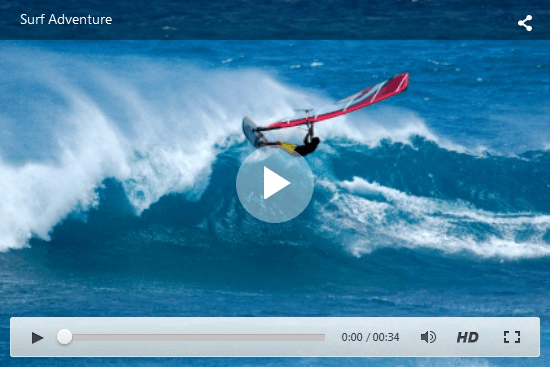 MP4 - MPEG 4 files with H264 video codec and AAC audio codec. WebM - WebM files with VP8 video codec and Vorbis audio codec. Ogv - Ogg files with Theora video codec and Vorbis audio codec. You can find additional and updated information about the supported HTML5 formats here. FLV support - For older browsers which don't support HTML5 natively, Internet Explorer 8 and 7 in particular, the player provides a Flash fallback method to play the video or audio file by rendering a Flash <object>, instead of the default <video> element. 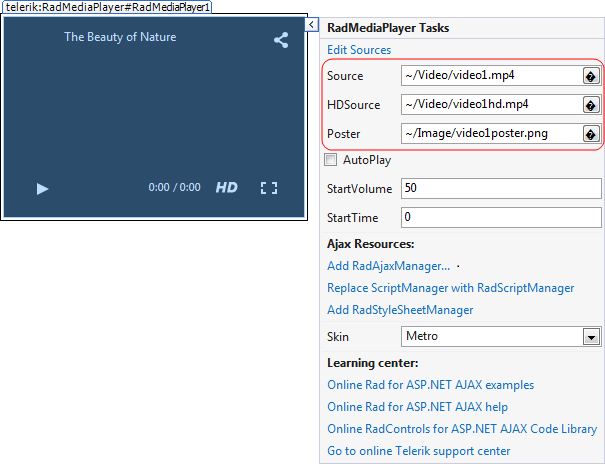 This improvement enables the RadMediaPlayer to support FLV video format on all browsers by rendering as an <object> automatically when the provided video is of FLV format. 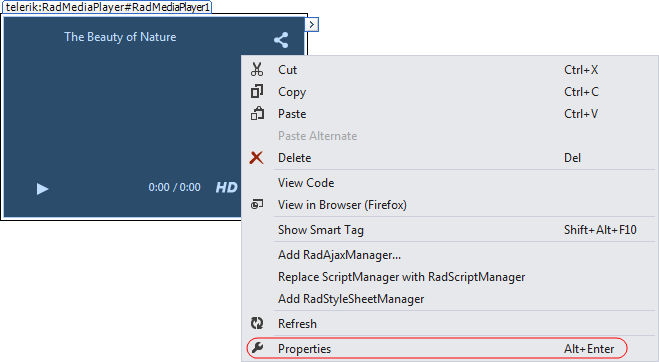 For configuring the remaining settings of the RadMediaPlayer please refer to the Playing Video File section above. You can easily enable users to play YouTube videos on your web site by including a RadMediaPlayer on your page and setting its Source to the desired YouTube video link. 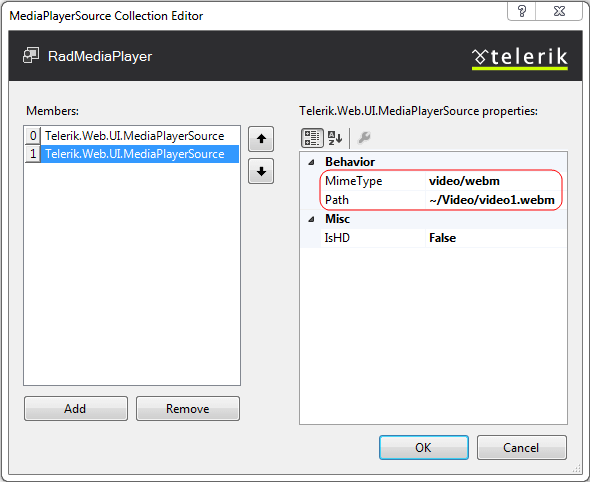 <telerik:RadMediaPlayer RenderMode="Lightweight" ID="RadMediaPlayer1" runat="server" Width="640px" Height="360px"
Playing a YouTube Playlist also requires a YouTube API Key in the Web.Config file. You can find additional details here.